Infused water is just water that you add with fruits, vegetables, and herbs so that the added ingredients will give flavor to the water. A popular example today is lemon water. Besides the variety of flavor you can come up with depending on your combination of ingredients, you also get health benefits from some of the nutrients that the produce and herbs impart to the water. It is easy to make infused water. But you might want to keep in mind some of these things when you are making your infused water. Filtered water is always better to use when making infused water. You're sure that filtered water is clean, and this affects the overall quality and flavor of the infused water. For households where potable tap water is available and filtered water is not easily accessible, it is okay to use tap water. But, as much as possible, use filtered water. When making your infused water, use room temperature water or cold water. Don't use warm or hot water because the produce you will add might wilt a rapid rate and some nutrients are heat sensitive. Hence, you don't get as much nutrients into your water. What types of produce should I add? If possible, choose organic fruits and vegetables. You can most likely buy these from the produce section of the supermarket. But it's probably better to buy from a farmer’s market or directly from the local farmers so you're sure that the fruits and veggies are really fresh and are without added fertilizers or chemicals. Organic produce tend to give a better taste to infused water. But what is most important is that you have healthy infused water with your favorite fruits and veggies. If you are not able to use organic, don’t be too concerned about it also. How do you prepare the ingredients for the infused water? After selecting the ingredients for your infused water, the next step is to prepare them before putting them into the pitcher. Always start by rinsing the fruits and vegetables, even if they are organic, it is still good to rinse them first to be sure they are clean. When using herbs, crush them first with a muddler to help release the oils. You don't have to crush the herb if it is leafy, like mint or basil. Cut fruits and vegetables at least in half before putting them in the pitcher so that the water will be flavorful. Hard fruits and vegetables, for instance cucumber and apples, can take longer to release their flavor in water, so cut them into thin slices. Berries and citrus fruits are softer, so slicing them in half or quarters is just fine. What container is best to use in making infused water? Now that you are ready to put your infused water together, it is important to use the right container. Technically, you can use any container, but a glass pitcher is recommended. Regardless of what container you want to use, just be sure that it is BPA-free and food-safe. Some plastic pitchers are not advisable because the water doesn't remain fresh. 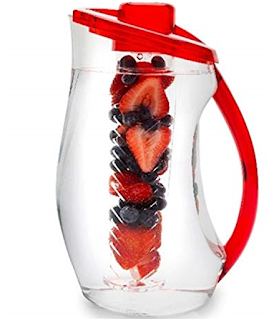 There are pitchers and cups that are specially made for infusing. Typically, the container has a long and narrow section in the middle with holes or slots. You put the herbs and fruit here so the flavor can be released. It's up to you if you want to use this type of container, but it isn’t necessary. How long should the produce be soaked? When making infused water, first put the fruits, vegetables and herbs, then add room temperature or cold water. Then, let the water infuse to get the flavors and nutrients from the fruits, vegetables and herbs. If leaving the container out on the counter, about 2 hours is enough. If storing in the refrigerator, the infusing process takes 4-6 hours. Let it infuse overnight for the best flavor. How long is infused water good for? The best time to drink infused water is 24 to 48 hours after the infusing process. Drink it the same day, though it can be consumed up to 3 days. Just don't leave the fruits and vegetables in the water. The solids should be removed and only let the water remain. Citrus fruits can be soaked in the water longer, but not melons which become soft and mushy easily. If you will drink the infused water the same day, you might want to refill the pitcher with water and soak the produce again. You can still get a good flavor from this infused water. 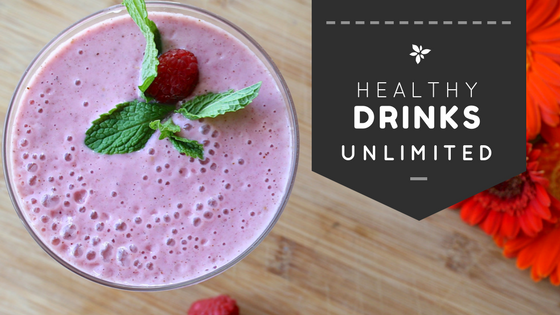 Can Smoothies Help You to Lose Weight? Disclosure: HealthyDrinksUnlimited is a participant in the Amazon affiliate program and other advertising network programs, which provide means for site owners to earn advertising fees.